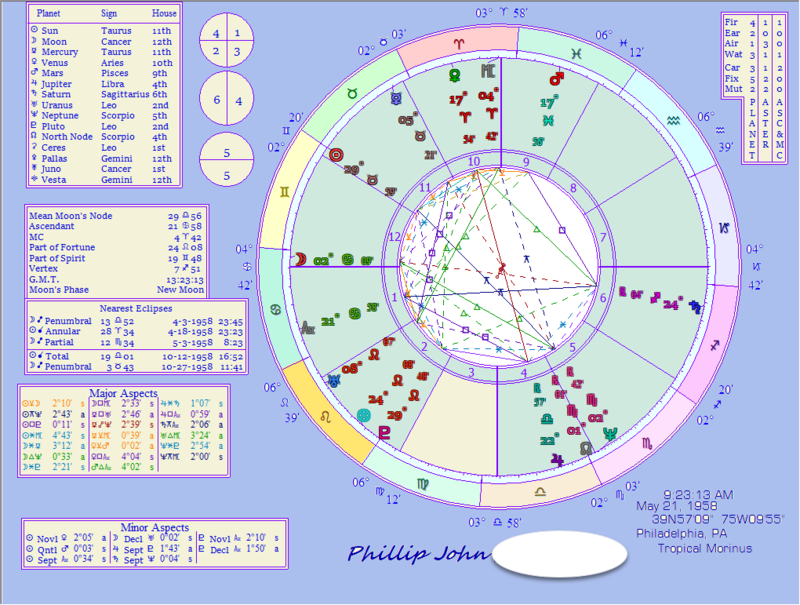 This chart of Phillip John is cast for his hometown of Philadelphia. He was born on May 21 1958 and not a Gemini but in the last legs of Taurus at 30. right on the twelfth house cusp. Jupiter in the fourth house though suggests that he will be moving around and away from there by the time he is 22. He got married then and left for New London and Electric Boat and never went back. Sextile to Jupiter is Pluto opposite Mars, a rather martial aspect that gets a point focus at Neptune in Scorpio, that fits his career as a career naval welder well, suggested by his Neptune conjunct the previous partial eclipse Moon at 12.34. Venus in the tenth house is obviously his meeting of his first wife and his attraction to her at first sight. They met at Delaware River Gap on Memorial Day and it was kismet — they were married just 6 months later. His Mercury in Taurus opposite Neptune suggests outside of work he is taciturn. The two sour notes in his chart is his uneven work history because of his reliance on government spending and the other of his Moon in Cancer on the first house angle, showing his battle with alcoholism. It has a trine to Jupiter so it obvious that his unsteady work history and necessary relocation did not help that. Phil is a Splash Temperament Type.